Who hasn’t dreamed of standing in the African Savanna watching herds of plains animals gallop by? 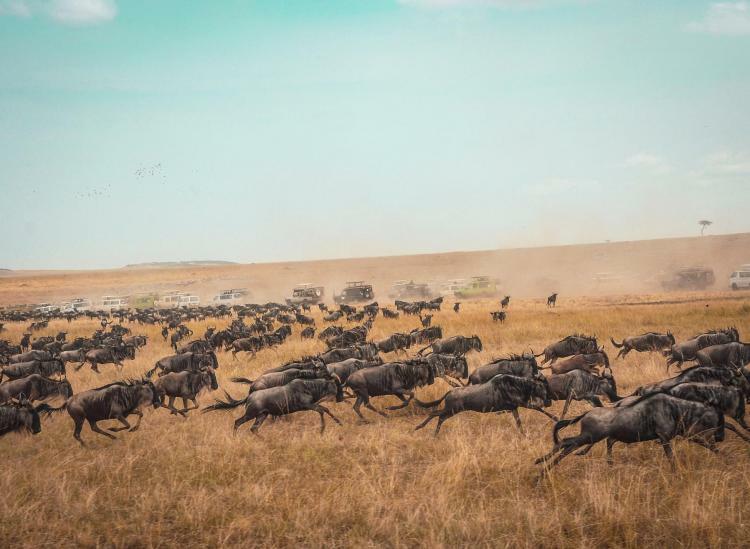 If the Great Migration is on your bucket list, we think you’ll love these animal migrations around the world. From butterflies to whale sharks, here’s where you should go to be in the midst of animal life on the road. Millions of wildebeest, zebras and gazelles cross the Serengeti each year, going from Tanzania to Kenya between July and October. California gets thousands of elephant seal visitors every winter, with the male seals reaching the larger Bay Area in December, females arriving in January and the new seal babies being born in January and February. Monarch butterflies fly 3,000 miles from Canada and the northern United States to Southwestern Mexico in January and February. Caribou leave their summer habitats to travel up to 3,000 miles to better winter spots, leaving the coast in the summer for the more sheltered inland in the winter. Ten million fruit bats come to one single swamp in Kasanka National Park in Zambia in October, November and December every year. That makes the air fill entirely with bats. It’s actually the biggest mammal migration in the entire world. The prize for the longest migration ever goes to the whale sharks (12,000 miles!). The average whale shark joins its whale shark friends along the Yucatan Peninsula between May and September. Kenya’s Lake Bogoria and Lake Nakuru are taken over by flamingos in April, May and June. The pink birds converge on the lakes, turning them pink as they come to feast on algae. We all know about the march of the penguins from the movie, but the March migration in Antartica when all the penguins move home is truly one of the world’s most awe-inspiring spectacles.